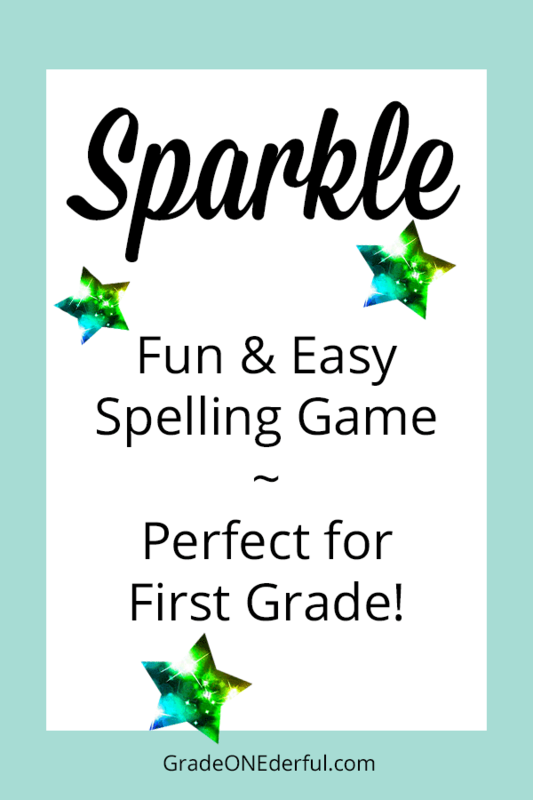 I play a spelling game with my class every Friday called "Sparkle". They LOVE this game and literally beg me to play it. Everyone stands in a circle. I let the special helper start first. I hold up one of six spelling words we've been practicing. Everyone has a quick look at it then I hide the word. The kids take turns spelling the word (one letter per child at a time). When the word has been correctly spelled, the next person says "sparkle" and the next person sits down. Person A says "w". Person B says "h". Person C says "e". Person D says "n". Person E says "Sparkle" and Person F sits down. The game continues in this fashion until there is one person left standing. For the second round I don't show the words, I just say them. The game moves VERY quickly. Anyone who says the wrong letter or doesn't say sparkle (because they're not sure if that's the end of the spelling .... or maybe they weren't paying attention) has to sit down. The kids are super focussed and happily it's not always the best spellers who win. We usually play at least 3 or 4 rounds. Hope someone can use this game! Let me know what you think if you try it. I almost forgot! I'm having a BIG give away sometime this weekend. An educational company contacted me and they want to give YOU a free spelling / reading computer program!!! What a great game! I love it! I love it!!! What a cute and creative way to make those spelling drills (which are so important) seem so fun!! My kids love this game too!! We play Sparkle too! It's a great game. My kids love Sparkle. I love that it makes them have to pay attention as well as know how to spell the word. Your right, the kiddo love this game. We play it almost every week!!! Sparkle is a favorite in all my classes! Thank you for sharing Sparkle. I was just thinking I need to change up my spelling routine! I love all the great ideas you post on your blog. I love Sparkle. I've used it more in math for counting backwards,and skip counting reviews. My kids beg me to play it all the time! Thanks for sharing your idea for using spelling words, I'm definitely going to try that method. I've played that one for years and yes, the kids LOVE it! We do it with counting, too. I show a flashcard from 1-20 and we count that many, then Sparkle, and sit down. I play it with math when we do counting by 2s 5s or 10s. We designate a number as the out number. It sounds just the same except no one says sparkle. I will have to try sparkle too! The book looks great too! Sparkle sounds so fun!! Even though we only have 6 days of school left...we may have to play that! My kids love this game too! We play by sitting on our desks, when you are out, you sit in your chair. They love it!